Everyone - readers and future readers of all ages! Children who are too young to read by themselves are encouraged to participate by having a parent or caretaker read to them. You don’t need a library card to participate, but you will need one to borrow books and other library materials. You can apply for one at any Queens Library location! A parent or guardian must complete a child’s application while teens and adults must present ID that shows proof of address and has a photo. Visit your local library to sign up for a library card and get more information. What does summer reading involve? In addition to tracking your reading progress with book logs, summer reading involves special programs for children and adults at local library branches. Ask at your local library, visit the Programs section at queenslibrary.org or check program listings in the Queens Library magazine, available online. 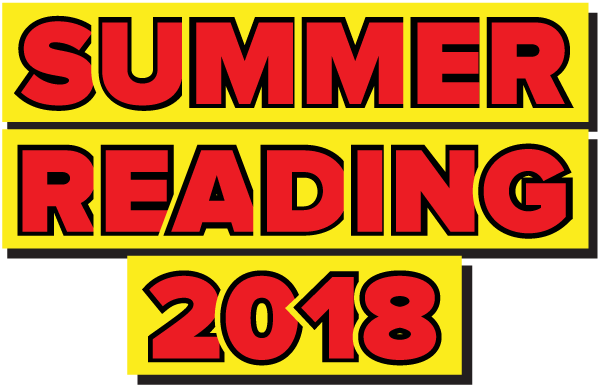 You can also check out the programs listed on this summer reading page! How can I participate at my local branch? In the spirit of rock and roll, each library will receive a stand-up cutout in the shape of a guitar. Based on achieving their reading goals – measured in books read or hours read – students will be able to affix a dot sticker to the guitar. The goal is to cover the guitar in as many stickers as possible over the summer. Each library will come up with its own summer reading goal and the libraries that meet their goals will receive a prize. Another summer reading initiative, the Battle of the Books, will feature two books facing off each week. Children and teens will be able to vote for their preferred title. The title that wins moves on to the next round of the battle. Read all of the contenders and cast your votes at your branch to be a part of the Battle of the Books. Talk to your local librarian – details for contacting your local branch are here!